Note: Nobody has to come for the whole 4 hours! Come when you can, leave when you must. I know everyone is busy this time of year, and then there’s those pesky day jobs, too. Please send me an email (bigbonegalAThotmailDOTcom) if you’re planning to come, so that we have some idea of what the demand will be for tapestry needles, munchables and potables. As scientists map the human genome, I hope they are looking for the gene labeled “deadline-oriented”. This is a very real thing in human behavior: gittin’ ‘r done in the face of a deadline. Surely this must have been a survival-enhancing trait for early man, which is kind of amazing when you consider that they didn’t even have a calendar back then. They must have had to have their squares knitted by the next full moon or something. The deadline brought a ree-diculous quantity of squareliness to my doorstep. This load of love was brought to you by: Seanna Lea, Rev. Linda, Sally D, Kate R, Eve B, Margo Lynn, Sara L, Laura L, Celia, Tish, No Name from Tennessee, Gwen M (again! ), Jorun, Sally, Betsy T from Classic E, Anne R, Stacey P, Marlena C, Barb C (and daughter Stella! ), Kathy D, Ren W, Joyce T, Jan, Kathryn K, Angie N, Mary Lou E, Adrienne, Danielle (fun fact: Danielle used yarn she received in her Hefty Bag Contest prize from you, Ann), Cynthia N, Sandy R, Gusty, Marie P, Birdsong S, Joanne E, Lisa, Elizabeth D, Leslie B, Colleen, Annell, Julie McC, Laura K, Stephanie, Vicki, Marina M, Kate R, E.H., Laura T, Al, Morna C, Mary Lynn, K.D., L Moon, Kathryn R, Theresa H, Jennifer M, Melissa, Becca, Robin S aka Clif’s Teacher, Mary B, Mary Sue T, Francie O, Kelly S (again! ), Susan, Patty M, Helen C, Sheryl, Emily, Felicia R, Kathleen N, Julie B, The Rubins, Alexis J, Jennifer, Libby B, Barbara C, Dale-Harriet, Pink Sky, Mary B, Kathy K, Wendy S, and Lacee. PHEW! My linkerator is hurting! In the crowd, I came across this square. You think I’m lying, but I swear I could see this square, anywhere, and say, “That one is Ann’s.” It’s so you! So mostly-not-an-actual-color, so drabby-graybrown, and then that wedge of jazzy citron (is it yellow? is it green? YES!). Your squares–this one and its many handsome siblings–betray you. Have I re-counted them yet? No. Are there more? Yes. There are quite a few straggler envelopes that I’ve yet to open and inventory. Thank you, everyone. I’m so glad people “didn’t have time to knit many” squares this time of year; if you had had any more focus, my linkerator would be busted, and I’d be sewing until the end of time. Am I truly the first one to comment? Wow. Even though I didn’t see my squares in the picture, I feel famous now that my name is included in the list! Even if it is linkless…who knows, maybe someday I will have a blog…if anyone’s really dying to “meet” me, I’m Huron on Ravelry. 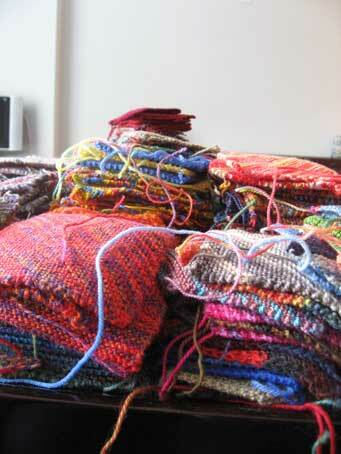 :-)Looking forward to seeing the finished blankets! I have that grey. And nearly that citron/limey/yummy/not-quite-solid green, too. But no, I did not make that KILLER GORGEOUS square, as you point out, that honor belongs to Ann. Wow. I’m excited about the sew-up (I will email, no need to take the info from this comment), but also excited to know about the Phila*Craft HQ activities. I know there is NOTHING BORING about that. you know how to warm my heart, kay. look at all those squares!! are there rubbermaid (TM) containers big enough? I see my squares are among friends…. I love the little square tip. It’s like the square is waving hi! I KNEW they’d keep coming in. And given the delays of holiday rush at the post office, I believe you will be “snowed in” next week as well. WOW! Those Partials (that’s what I called them) really got me thinking about doing a whole blanket of Partials, all partial in different ways. I’m telling you, you and yer blankets and squares and stuff, they mess with a person. That is a totally SICK (sick the way 8 year olds who skateboard say it) pile of squares. Good sick. I will be there my dear! full of flax seeds. I’m just totally enjoying this, Kay. Wish I could be there for the great sew up. Ann (from previous post) – I hear ya’ – Sick (we would have maybe said cool or even “rad” – I have a 14 yr. old teenage boy – I guess I’m still learning). Question for all: I, too, am addicted (to the squares.) I’m still going strong, but for personal gratification. I won’t send in anymore squares unless I hear a need. I am considering a baby blanket or something. My question is, when I get to the last three stitches to bind off, my corner is rather “holely”. Does anybody have a trick? Kay, you rule. Thanks for the “linkerator” laugh. And good luck with the sewing. Phew. 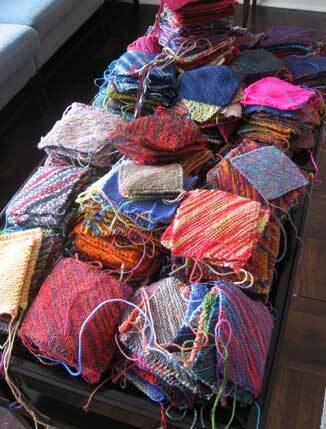 I’m feeling less guilty about only having time to get a few squares done. Thank you! 🙂 How many blankets-worth do you think you have? That’s one big load of squares! Look at that explosion of squares! My squares look happy to finally be amongst their peers. And my little girl was so excited to see her name on the list… thanks for that! I eagerly await the final layout. I can only imagine just how spectacular it will be… I only wish I could help with the sewing up, but alas, a cross-country flight would be impossible right now. I’m sure you’ll have many eager hands, though, sewing lots of love into that blanket. 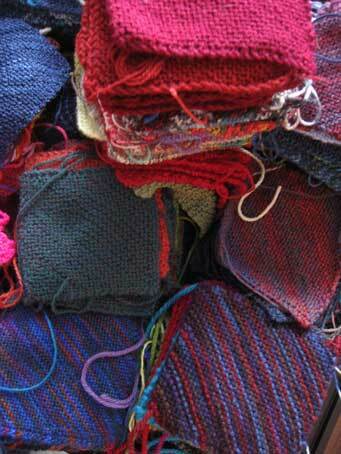 However, I do live in NYC, so I’ll come to the sew-up with my bits of sock yarn to help in the finishing phase. I love sock yarn, but I hate making socks. This project has inspired me to glance at sock yarn again. Enablers! Could you post, rather prominently, where we can invest in winning the resulting (probably several) afghans? Or is that too premature? Anyhow, can’t wait to see what others have wrought. This is one of the best uses of the Internet that I can imagine – the needs of the one inspiring the work and fun of the many. I cannot wait to see the final fabulous results. 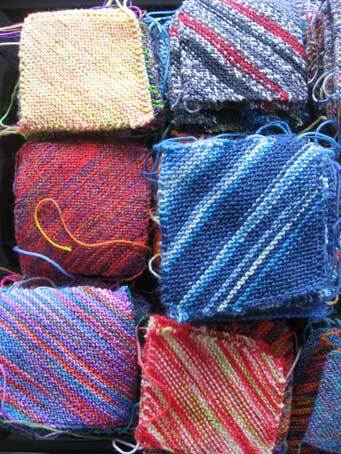 I didn’t contribute any squares although I would love to help with the sewing up…. are you still in need of volunteers? ann, are you going to NY for the gittin ‘er done? I am so amazed. And yet not. When we first asked for cloths for Cloths for Katrina (and now when we ask for Cloths for Crisis) this is the sort of response we got (get) from knitters far and wide. We all deserve a standing ovation for being the most caring wonderful folks in the world. With terrific leaders! Like you gals! I don’t see mine in there yet. I know there’s a big pile arriving along with my squares, and there’s a mighty pile there already. Hmmm, d’you think the total will reach 1000 squares? 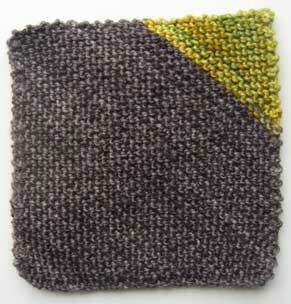 I think I might be a little bit in love with the grey square and it’s tantalising bit of citrus. And to Ann – please do make an entire piece out of squares like that, please, yes, please do. “trouble with tribbles”—oh yes indeedy, that’s it in a nutshell! Kudos to everyone involved. All of y’all are absolutely awesome. I didn’t get a clue until much too late to participate but am inspired for other worthy projects. but…but… I sent squares a while back (before Thanksgiving), and don’t seem to have ‘made the roster’ anywhere… sadsadsad.